The United Nations says that there are approximately 2.5 million Internally Displaced Persons (IDPs) in Darfur and that about 6.5 million people in total are in need of humanitarian assistance in the country. 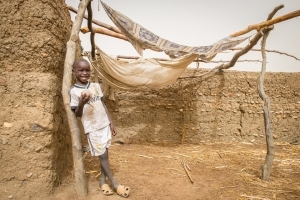 There are great needs in areas affected by conflict such as Darfur. “Much of the population in conflict affected areas are living in poverty, many people have fled their homes and have no way of making a living. After ten years of conflict the numbers of newly displaced people has again increased this year, funding is falling and this puts massive pressure on camps and existing services,” says John Birchenough, CAFOD (Caritas England and Wales) Emergency Programme Manager for Sudan. Despite hopes that overall access to food in Sudan will improve in the 2014/15 main season, there will still be difficulties in guaranteeing food security in areas affected by conflict in Darfur, particularly amongst displaced populations. For these people, low food stocks, limited access to markets and economic issues pushing prices up and reducing buying power means many of them will continue to be affected by the conflict in 2015 and their health will suffer unless action is taken. The Caritas/ACT emergency programme for Darfur for 2015 will focus putting more power in communities’ hands to respond to the many challenges they face. The programme will focus on boosting health and nutrition; providing water, sanitation and hygiene; encouraging children into school and providing skills training for those displaced and also for the national staff who help them. Around €980,000 (US$1.2 million) will be spent improving the health and nutrition of 250,000 people. The programme includes the provision of essential medicines, the training of health staff, the provision of extra nutrition to vulnerable babies and children and helping boost the health nutrition of pregnant and breastfeeding women. Over 250,000 people will receive increased access to clean water and better sanitation and hygiene as part of €1.2 million (US$1.5 million dollar) investment in water and sanitation projects. The construction of permanent classrooms, investment in teacher training and school materials will aim to improve the primary education of six thousand children. Almost 12,000 households will benefit from training and support in agriculture aimed at improving food production and giving the local population increased independence from outside help. Over 50,000 people, affected by disasters, will receive non food items, and where relevant, training and help in building their resilience to future disasters. Almost 150 national staff will benefit from training and the strengthening of institutional capacity so that Sudanese staff play an increasingly greater role in Caritas’ humanitarian response in Darfur. *The ACT Alliance is a network of Protestant and Orthodox churches and church-related aid and development agencies worldwide.